ANF, NEWS DESK ─ PKK (Kurdistan Workers’ Party) Executive Council Committee Member Murat Karayılan has made striking statements regarding the ongoing state terror and popular resistance in Bakur (North Kurdistan). Answering questions by Radio “Dengê Kurdistan”, Karayılan said the process has entered a new phase as of 14 December, and a state of civil war is taking place at the moment. Karayılan stressed that the Turkish state wants to seize the will of Kurdish people, and vowed to continue the resistance in response to the attacks. Below is a compilation of the outstanding parts from PKK Executive Karayılan’s interview provided by “ANF English” service. What is the goal of the Turkish state in perpetrating an intense onslaught against self-rule? The struggle of our people has entered a historic and significant phase. There is a war ongoing in the Middle East, in which the Kurdish people and their freedom struggle has come into prominence. It is known by everyone that the region will be restructured at the end of this war. Kurdish people’s success in mainly Kobanê and Şengal (Sinjar) have proved them a main actor in the Middle East. The region cannot be redesigned without the Kurdish people. In this regard, a new phase has begun. The Treaty of Lausanne which is based on a denial of Kurds is now losing effect. This reality has scared the sovereign powers that hold Kurdistan under their control. As Davutoğlu himself has stated, this decision of an all-out war was made after the Kobanê victory, at the MGK (National Security Council of Turkey) in late October. They want to break Leader APO’s (Öcalan) will by means of this war. The war had already began in Imrali prison on 5 April. It was started against Leader APO. This war has now entered a new phase with the attacks aimed at our people today. The Turkish state wants to leave the Kurdish people without will, suppress them and impose slavery. They want the Kurdish people to surrender and not to demand self-rule. The AKP has started this war for this purpose and it is deepening it more and more every day. This war entered a new phase after 14 December. What is this new phase? The conflict is evolving into a civil war. Some liken it to the 90’s but the current process is more like the periods of 1925, 1930 and 1938 when our people in Dersim were crushed by the Turkish state for defending self-rule. The method and the situation is still same. This is an operation of occupation, massacre, seizure of will and imposition of slavery. This is a civil war declared by Turkey against the Kurdish people living within its borders. The President openly pledges to crush us into the trenches and respond to every uprising with repression. They clearly want to seize the will of our people who have reached a stage of national and organisational struggle under the leadership of Leader APO (Abdullah Öcalan). Declaration of self-rule by the people in many areas is a progressive occasion from the point of the Kurdish freedom movement. The Turkish state and AKP want to draw the Kurdish people away from this stage. They want to make the Kurdish folk a slave by re-seizing the positions they gained at the cost of their children’s lives. The massacre that targeted Dersim, Zilan and Sheikh Said‘s cause is now perpetrated by AKP in a new postmodern manner. In an attempt to hide the happenings from the world, mobilised pro-government media reflects everything reversely, which hinders the perception of the truth, even by those calling themselves intellectual. There are also some collaborators from among Kurds, and these attribute all the happenings to the trenches. Trench is a self-defense. Kurdish people have been forced to dig trenches to defend themselves. The point in question is, however, not trenches but the intention to leave the Kurdish society without will. While doing this, they don’t want to world to know and learn about it. Despite the internet age, they reverse the truths in an attempt to reflect the happenings in another way, justifying the operations on the excuse of trenches and the PKK. This is not true. Kurdish people have become a will and they want to live by enjoying their rights like all other folks, without being deprived of their honour and status. The state wants to render Kurds slaves part by part, like in Cizîr, Silopî, Sûr, Kerboran, Nisêbîn now, and Gever, Bismil, Dêrik before them. A large-scale war is being waged against the Kurdish people. On the other hand, an effort is also being made to reflect the reality wrongly. State forces are shelling and burning a mosque, and later say that PKK did it. The state puts the blame of its own perpetration on the other side. It distorts the truths in an attempt to not to reflect the civil war and not allow the world see it. The state wants the Turkish society and Kurdish people not to realize what is going on. It wants to weaken the Kurdish people and bring them down to a point of not being able to defend themselves, just like what happened in 1920’s. With a desire to confront Rojava, the Turkish state wants to achieve a result by creating a war and conflict in the Kurdish politics. It is making a huge effort to hinder the Kurdish people from taking a place in the restructuring of the Middle East. This is the main strategy of the AKP government. Youths, women, children, elderly and everyone is resisting the attacks in the areas of self-rule. What does trench and barricade, a new manner in the Kurdish popular resistance, mean? Before anything else, I salute all our people resisting the attacks. The voice of Kurdish youth in Kobanê, which resonated all around the globe in the person of Arîn Mîrkan and Gelhat, does today resonate in Cizîr, Silopî, Nisêbîn, Kerboran and Sûr where people are resisting with the same spirit. This means a new level in the Kurdish freedom movement. This is a very sacred instance. Our answer to those who repeatedly complain about trenches is; these trenches are for self defense and defence of will. Those questioning trenches should then produce a solution against these fascist attacks. Will they be able to stop AKP’s gangs? No. In other words, these remarks just call for a surrender. Everyone calling themselves a Kurd, a Kurdistan citizen, patriot and democrat should see and join this resistance. They should be in solidarity with this battle of humanity against atrocity and fascism. This is a battle of existence and will, it has such a national goal. One other goal of this struggle is democracy. Kurdish people’s resistance against AKP fascism is also for Turkey’s democracy and attainment of a will by the Turkish society. In this regard, this resistance is a fight for Turkey’s democracy and freedom, which is why all the leftist, socialist, democratic and pro-peace movements should embrace it and show solidarity. This is the resistance of all ethnic and religious minorities. It is the resistance of diversities, democracy and freedom against ‘one language, one nation, one state, one flag, one religion’. The peoples of Turkey, all those oppressed by the system, all laborers and faith groups should own the Kurdish people’s resistance in Cizîr, Silopî, Nisêbîn, Kerboran, Sûr and all across Kurdistan. These attacks result from the weakness of the state. They have started these attacks for fear over the Kurdish people’s growing stronger. They wouldn’t deploy tanks on the streets if they were not weak and afraid. They know this is the final point. Yet, the will of our people is stronger than tanks. This is a popular resistance that is stronger than everything else. The AKP cannot perpetrate another Dersim genocide today. For this reason, all the patriots, Kurdish people and their friends should stand together and break the attacks of the AKP that is living its weakest period. Turkish state says 200 members of PKK and YDG-H have been crushed. How do you assess these claims? This is not true. AKP is telling that guerrillas have come down from the mountains to cities in order to justify its attacks against our people. 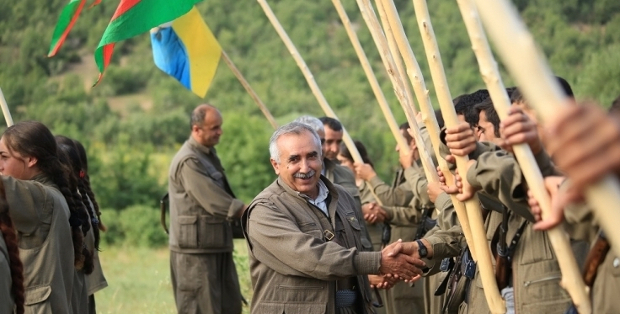 HPG hasn’t got involved in this war and process yet. It is the Kurdish youths and our people that have taken up arms, dug trenches and are resisting in the areas under attack. If the state has killed so many people, where are their corpses then? Where are their arms? These are all a lie. They are murdering our civilian people with the assertion “we are deploying troops as guerrillas have come down from the mountain”. The youths are resisting with light arms but we stand by them to the end. They are the future of Kurdistan, they are fighters of freedom and democracy. The Kurdish people shouldn’t leave the youths alone as they follow the perspective of Leader APO who says that peace will be brought by democratic resolution and freedom. The state wants to break this resistance and wants Leader APO to step back. This is why such an all-out war is being waged against the Kurdish people today. The army has also become a part of this war in previously Farqîn and now Cizîr. I would like to warn the AKP, state and military officials that they are playing with fire. If they continue like this, guerrillas will also join this war in a self-sacrificing manner, and the bond between the Kurdish people and Turkish Republic will be severed entirely. If they crush our people with tanks and artillery, we will no more be able to live together. AKP officials are now planning to crush Kurds and then bring them to the table. Excuse us but nobody would sit at the table with those who killed our children, mothers and elders. We are not needy of them. The situation is no more the way it used to be. They need to know this reality and act accordingly. The army firstly avoided deploying troops in cities. But why has it done that now? This is obviously a coup aimed at democracy and Kurdish people. These attacks are severing the ties between the Turkish and Kurdish peoples. Everyone should take careful steps and know that Kurdish people do never surrender and they attribute the life to resistance.